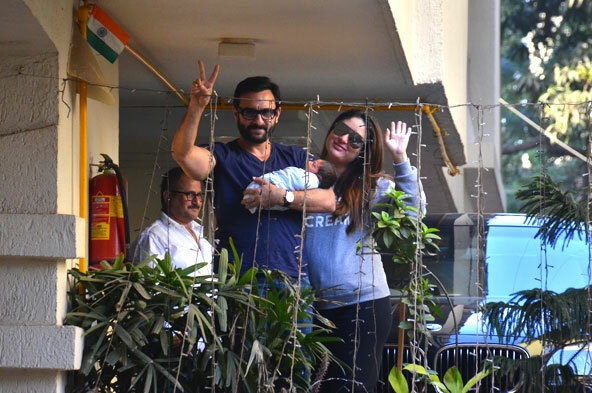 Kareena Kapoor Khan and Saif Ali Khan are not leaving any stone unturned to make sure that their newborn child Taimur Ali Khan feels like a prince! After setting up his nursery royal style, the couple has already started pampering the tiny tot. Well, you don’t believe us? Then look at this picture. The couple ordered a custom made hamper from an online portal which specializes in luxury baby products. The hamper contains everything that a toddler would love. A month old Taimur got a custom made clothes and other goodies and we can’t help but feel JEALOUS! Check out the pic and you would wish to be born as a Pataudi kid, in your next birth! Oh No, we are not kidding. Kareena Kapoor Khan went back to work in just 46 days after her pregnancy and spoke a lot about her bundle of joy and how her life revolves around him! She is a perfect hands-on momma! We really love how she has been balancing work and parenthood from Day 1. Now, after walking for Anita Dongre at Lakme Fashion Week, she will resume work with Rhea Kapoor’s Veere Di Wedding with Sonam Kapoor. We will see her in an all gal movie and she is all set to impress us with her acting chops. At LFW, she made some adorable revelations about Taimur which made us go aww! She said, “Motherhood is going to be the best phase of my life. I am super excited. It has just been 46 days so, I don’t know about the change but yeah now your heart doesn’t beat inside you, it is outside in someone else’s body. When you look at your baby, you realise that.” She also described how Saif is all up and about being a daddy for the third time.